Background/context: There is a clear need for society to understand and address the needs of the increasing number of older adults, both those who are healthy and those with agerelated diseases such as dementia. Gerontology programs in higher education institutions are an integral aspect of this understanding but often have low enrolments. Adults who are working in aged care and who desire to continue their learning are an un-tapped resource. Initiative: The University’s Wicking Dementia Research and Education Centre has implemented an innovative, flexible, fully online Bachelor of Dementia Care degree for adults working in the aged care sector who wish to further their qualifications and provide evidence-based services to the increasing number of people with dementia. This online degree is the first of its kind. Method of data collection/delivery: Numerous data sets are embedded in the course to collect longitudinal qualitative and quantitative data on Knowledge, Skills, and Application and to measure student engagement, retention, and progression. Review of the project: This paper outlines the degree and the number of adult learners enrolled to date by state and country. 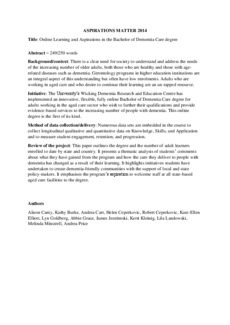 It presents a thematic analysis of students’ comments about what they have gained from the program and how the care they deliver to people with dementia has changed as a result of their learning. It highlights initiatives students have undertaken to create dementia-friendly communities with the support of local and state policy-makers. It emphasises the program’s aspiration to welcome staff at all state-based aged care facilities to the degree.